Fiona has been lucky to share her life with a variety of wonderful dogs including a border collie, Afghan hounds, boxers and, currently, a (still!) very adolescent weimaraner, a patterdale terrier and a rescue pug/llaso apso, one of whom is the Ruff Diamond on our logo. She has also owned, trained and ridden horses for many years. Several of her dogs had ‘issues’ and, in helping them to overcome these problems, she developed her interest in learning what makes dogs tick and in positive training methods. To gain experience, Fiona helped within a large training club as a class assistant for six years, before taking the decision to study further in order to progress to taking her own classes. 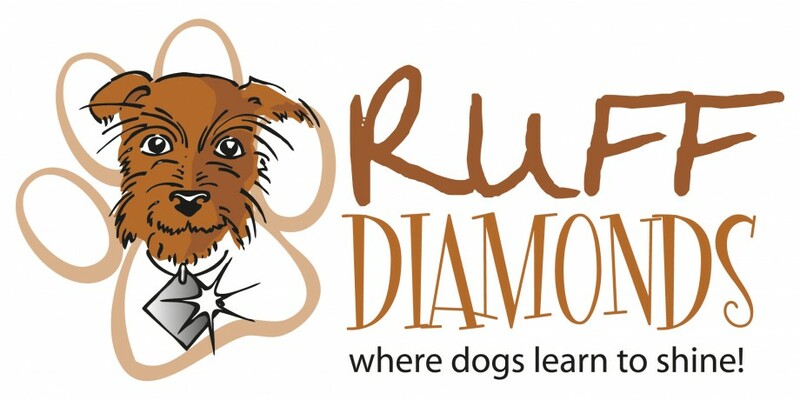 After two years, she decided to set up Ruff Diamonds and to concentrate on working with family dogs and their owners. She has a particular interest in training puppies and giving them the best possible start in life. Fiona has studied with Sarah Whitehead and Gwen Bailey, two of the UK’s most respected dog trainers, and has been examined and approved by the Association of Pet Dog Trainers UK (APDT, no 1160). She is committed to continuing to build her own knowledge by further study, attending courses and seminars, and in passing on that knowledge in a fun, interesting and informative way. Jackie and Kieran are both hoping to become trainers and, to gain knowledge and confidence, are assisting in classes. Between them , they have a huge amount of experience as dog owners. Jackie owns, shows and breeds Weimaraners and also has a young Slovakian Rough Coated Pointer. Keiran lives with and has had great fun training his young terrier cross. We also have a small team of very dedicated helpers, who happily make drinks, help nervous owners or calm excitable or worried dogs. All are experienced dog owners and/or just love the company of these wonderful animals!